For the third year in a row, Pita Jungle will host an “Empty Bowls” event in which guests can purchase hand-crafted clay bowls created by local artisans this coming holiday season to benefit Waste Not, a local 501(c)(3) nonprofit that has been feeding the hungry in the Valley for more than 25 years. All 15 metro-Phoenix Pita Jungle locations will sell a limited quantity of Empty Bowls from Dec. 1 through Dec. 15, with 100 percent of proceeds benefitting Waste Not. 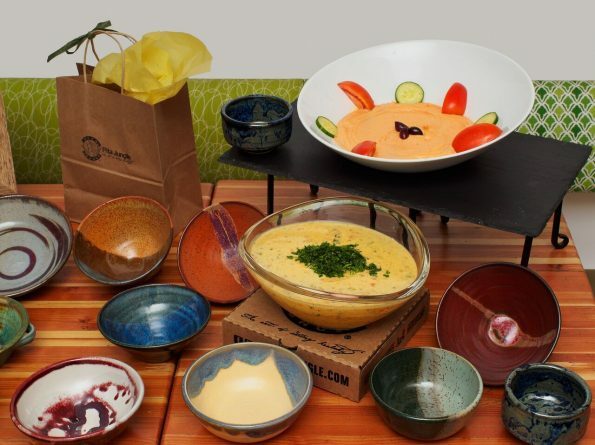 The Empty Bowls – hand-crafted, custom bowls created by Arizona Clay Association artists and their friends in the community – will be sold for $15 each at Pita Jungle. Guests who purchase a bowl will receive their choice of a small order of hummus, or a serving of soup, for dine-in or carryout. The bowls can be a meaningful, one-of-a-kind gift this holiday season or a new dish to grow a personal collection. Every dollar given to Waste Not feeds six people. Waste Not rescued and transferred a record 2.5 million pounds of food last year for those who needed it most. The Pita Jungle location in Mesa on Southern Ave participated in an annual Empty Bowls fundraiser held at Mesa Community College for several years. When the brand decided to take the initiative companywide in December of 2014, they joined forces with the Arizona Clay Association and each and every bowl was sold for a total of $3,150 raised for Waste Not in only six days. In 2015, Pita Jungle and the Arizona Clay Association more than doubled the amount of bowls sold in 2014, for a total of $7,320 donated to Waste Not. Since their partnership began 25 years ago, more than $500,000 has been raised for Waste Not through the Arizona Clay Association’s annual Empty Bowls event for the benefit of Waste Not. These funds support the organization’s daily operations, which make it possible to transfer up to 10,000 pounds of food per day to families in need throughout the Valley. Waste Not helps alleviate local hunger by rescuing excess perishable food that would otherwise go to waste, and delivering it to a network of more than 100 agencies and organizations that feed the hungry. To learn more about Pita Jungle, its locations and The Art of Eating Healthy®, visit pitajungle.com/locations. For the latest updates, follow Pita Jungle on Facebook, Twitter (@pitajungle), and Instagram; follow the Empty Bowls event at Pita Jungle on social media with #PitaJungle #EmptyBowls. Pita Jungle was founded in 1994 by three college friends and stands today as a $40 million restaurant concept with 19 locations throughout Arizona and one location in California. With the mission of helping guests sustain a healthy and balanced lifestyle, the restaurants serve up a diverse menu of tasty, fresh, wholesome food, including a variety of vegetarian, vegan and gluten-free options. Pita Jungle’s menu is influenced by tastes from around the globe to offer something for every palate, including dishes inspired by Mediterranean, Latin, Asian, and American cuisines. As an industry pioneer in self-expression, and appreciation for the community, each restaurant is developed to have a personality that is reflective of the local neighborhood. From the unique décor and monthly rotation of original artwork by local artists, to the custom, handpicked music playlist and creative, uniform-free staff, there are no cookie-cutter locations in the Pita Jungle system. The brand was named to “The Future 50: Fastest Growing Small Chains in America” by Restaurant Business in 2013 and 2014. For more information about The Art of Eating Healthy®, please visit www.pitajungle.com. Established in 1987, Waste Not is a local 501(c)(3) nonprofit that feeds thousands of hungry people in Arizona every day. With one in four children going to bed hungry every night, and 16.1 percent of the population in the state living in poverty, hunger remains a prevalent issue. The organization’s trucks and drivers are on the road six days per week to answer this need, by collecting an average of 10,000 pounds of excess perishable food from restaurants, resorts, caterers, grocers and various other food purveyors – food that would otherwise be thrown away. Waste Not delivers the food the same day to more than 100 diverse agencies that feed the hungry including schools, after-school programs, daycare centers, rehabilitation centers, transition homes and senior facilities. A record 2.5 million pounds of food was transferred in 2015. For more information about Waste Not, please visit www.wastenotaz.org.